You want to blog but your country clamps down on free expression on the web. What do you do? 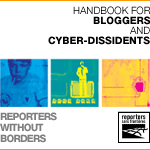 If you want to start blogging without risking your neck, I highly recommend a new resource in downloadable PDF called "Handbook for Bloggers and Cyber-Dissidents". Ethan from Global Voices takes this further in "A Technical Guide to Anonymous Blogging"
3. Visit web sites by starting at the-cloak.com and leave your trail behind. thanks for giving resources to our brothers and sisters who may have the technology, but not the freedom to use it. Next Post (n)	A Little Help on my Church 2.0 Article?